American eels (Anguilla rostrata) were once abundant in virtually all Maine rivers with access to the sea (Atkins 1887; Collette and Klein-MacPhee 2002) and were an important food source for residents of Downeast Maine, especially during the fall and winter. The American eel has a complex life cycle that consists of several morphologically and geographically distinct stages. Before one can understand the role that American eels played in the history and culture of Downeast Maine, it is first necessary to understand the basics of the American eel life cycle. appearance. They are small, transparent, and flattened from side to side. American eel leptocephali are transported by ocean currents for nearly a year until they reach the east coast of North America, at which point they metamorphose into an early juvenile stage known as a glass eel. Glass eels look like tiny, transparent versions of adult eels. As glass eels migrate into brackish and fresh waters during the spring, they develop the brown pigmentation that is characteristic of adults. At this stage they are called elvers and are still quite small, averaging about 50-90 mm in length. Elvers enter Downeast Maine’s rivers starting in early April, somewhat later than in southern parts of the Gulf of Maine. 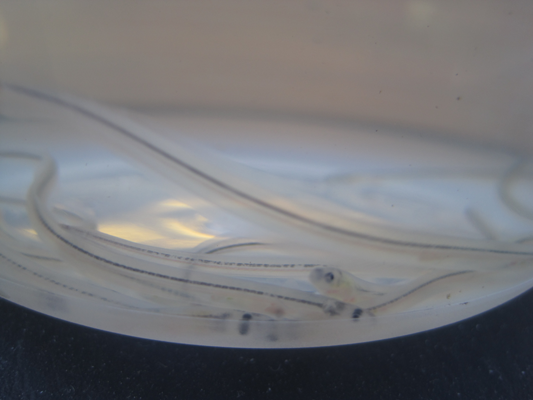 Once in brackish and fresh waters, elvers grow into an older juvenile stage called a yellow eel. This is the longest stage of the American eel life cycle, lasting from five to twenty years. When very near maturity, eels undergo yet another morphological and physiological change as they make their way out of coastal rivers and streams and back to the sea to spawn. At this stage they are known as silver eels. Spawning has never been observed in the wild, but it is presumed that all American eels die shortly after spawning (Atlantic States Marine Fisheries Commission 2000; Collette and Klein-MacPhee 2002). The American eel is the only species in Downeast Maine which is born at sea and lives most of its life in freshwater (a life cycle known as catadromy). Many other species found in the Gulf of Maine, including alewives, blueback herring, American shad, rainbow smelt, and Atlantic salmon are born in fresh water but live out their adult lives at sea (an anadromous life cycle; the word diadromous refers to fish that are either catadromous or anadromous). The diet of Maine’s native Wabanaki peoples was (and to some extent still is) based on a variety of plants and animals which were available at different times of the year. Eels were a major component of the traditional Wabanaki diet during the fall, when they were caught in the highest abundances, and in the winter when preserved eels could be relied upon until other species became available in the spring. The Wabanaki historically relied on both yellow and silver eels for sustenance. Yellow eels could be caught in estuaries and freshwater ponds and streams throughout the year. Silver eels were trapped in weirs during their downstream migrations in the fall (Prins and McBride 2007; Harper and Ranco 2009). Records describing Wabanaki use of eels before Eurpoean colonization in Downeast Maine indicate that most eels were smoked to preserve them for later use, though some were eaten fresh. They were also boiled and roasted and their backbones were sometimes used in soups. Eel skins were used for medicinal purposes, mostly for pain relief, and to make fire starters, rope, and other tools (Prins and McBride 2007). Eels appear in Wabanaki legends and artwork. The eel is the totem of the Neptune clan, an influential Wabanaki family with members in the Passamaquoddy, Penobscot, and Maliseet Tribes. One Wabanaki legend describes Chief John Neptune, a prominent Penobscot leader in the early nineteenth century, transforming into an eel to fight a rival chief (Prins and McBride 2007). European settlers in New England learned to fish for yellow and silver eels early on (though not early enough to prevent the death by malnutrition of many who sailed on the Mayflower). The Wampanoag Tisquantum (also known as Squanto) reportedly taught the starving residents of the Plymouth colony to catch eels (Franklin 2007). By the mid-1800s, eel fishing was an established practice among European settlers and their descendants in Downeast Maine. These harvests mostly supported local consumption. According to U.S. Fisheries Commission biologist Charles Atkins, when harvests were particularly large, yellow and silver eels from Maine would occasionally be shipped to New York. Atkins did not specify the rivers from which these exported eels were harvested, but it is possible that some were from Downeast Maine (Atkins 1887). In the mid-nineteenth century the American Sardine Company in Machiasport experimented with canning yellow and silver eels. They successfully marketed “fried brook eels” in cans, but could not harvest sufficient quantities to meet local demand, let alone export any to larger markets. Canned eels never became a big business in Downeast Maine or elsewhere in the United States (Earll 1887). Both Maine’s native Wabanaki peoples as well as European settlers and their descendants caught yellow and silver eels with spears, traps (pots), and weirs. According to Atkins, who provided the most detailed and authoritative description of Maine’s river fisheries in the mid- to late-1800s, “the implement most widely known and used for the capture of eels is the spear” (Atkins 1887). Atkins described a commonly used spear design that resembled a barbed rake affixed to the end of a wooden pole. This spear was used to target yellow eels in rivers and streams in the spring, summer, and fall. It was capable of capturing multiple eels at a time. Using this same tool and their knowledge of eel habitats and behavior, fishermen also harvested eels from ice-covered rivers in the winter (Atkins 1887; Collette and Klein-MacPhee 2002). Yellow eels are most active at night; during the day they usually rest in muddy river and stream bottoms where they can be relatively easily speared by those who know where to look for them (Klien-MacPhee 2002). Eel pots were also commonly used in Downeast Maine in the nineteenth century. Usually made out of woven strips of black ash or other types of wood, these pots resembled long baskets with concave funnel-shaped entrances. Eels were attracted to the pot by the scent of fish parts emanating from inside. Once inside, they could not easily find their way out through the small end of the funnel. Atkins described these eel pots as “a very old method of fishing” (Atkins 1887). Modern-day lobster traps are based on a similar design. Weirs captured silver eels as they migrated to the sea in the fall. Weirs are barriers that direct migrating fish into a net or a small pen from which they are easily harvested. The walls of weirs in Downeast Maine were often made of brush or slats of wood held up by wooden rods (Atkins 1887; Prins and McBride 2007). Weirs could be modified to capture either catadromous (eels) or anadromous species (river herring, American shad, Atlantic salmon, and others) by changing the position of the trapping device to face either downstream or upstream (Prins and McBride 2007). Fyke nets, a stationary type of net with two “wings” that guide fish into a net bag, were used to capture yellow eels in other states along the East Coast throughout the nineteenth century; however, they were likely not used in Downeast Maine to capture eels during that time period (Atkins 1887). Eels were once present in all freshwaters with access to the sea in Downeast Maine; however, some areas had higher eel abundances than others. For example, the Kenduskeag Stream, which passes through the city of Bangor, was once known as Kadesquit, a word derived from the Maliseet word kat, meaning eel. Kadesquit can be translated to mean “eel weir place” (Prins and McBride 2007). Great quantities of eels were once caught along the Kenduskeag, both by Wabanaki peoples and later by European settlers and their descendants (Goode 1887; Prins and McBride 2007). Other key eel-fishing rivers in Downeast Maine included other tributaries and mainstem Penobscot River, the Harrington River (which had a notable winter eel fishery), tributaries of the Sullivan River, and the St. Croix River (Atkins 1887). Dams that powered sawmills, textile mills, grist mills, and paper mills, many of which were later modified to generate electricity, were important drivers of economic and population growth in Downeast Maine and throughout New England; however, economic progress did not come without costs. Many dams and other impoundments built in Downeast Maine during the nineteenth and twentieth centuries took a heavy toll on eels and other river-running fish species. These dams limited the access of silver eels to the sea and elvers to freshwater. The best way to improve habitat availability for eels and other river-running species is to remove dams; however, dam removal is not always feasible or desirable. In cases where dam removal is not a feasible option, many adjustments can be made to dam structures to help eels and other fish bypass or overcome such barriers. Turbines can be turned off during peak migration times and various types of fish ladders can be built around dams. In modern times fish lifts mechanically lift fish over some barriers and at other locations fish are transported around dams by truck (Natural Resource Council of Maine 2003). Some modifications such as fish ladders and fish lifts may work relatively well for other species, but pose challenges for eels due to their unique shape and swimming behavior. Fish such as alewives, bluebacks, shad, and salmon are better able to swim against swift currents than are American eels. Fish ladders designed with these other species in mind may create currents too swift for eels, especially elvers, to pass through (National Marine Fisheries Service 2012). Eels do, however, have one advantage over other river-running species when it comes to barriers such as dams: they are particularly adept at climbing and can come entirely out of the water (for brief periods of time, and mostly only at night) to overcome such barriers (Atkins 1887; National Marine Fisheries Service 2012). Elvers have been known to climb what would seem like impossibly steep and high barriers with only a very small amount of water passing over them. Structures designed to promote eel passage usually incorporate a rough surface to help elvers climb over or around dams (National Marine Fisheries Service 2012). The number of eels that make it past such barriers, with or without special modifications, is unknown. It is likely that only a small percentage of eels successfully overcome such barriers, even with modifications designed specifically for eels (Atlantic States Marine Fisheries Commission 2000). Some industries associated with dams in Maine released a variety of pollutants into Maine’s rivers, which likely affected the quality of eel habitat as well as the health of the eels themselves. American eels are long-lived, have a high fat content, and spend much of their time near the bottom of rivers and ponds. These characteristics make them particularly vulnerable to persistent heavy metals such as mercury and other toxic substances that accumulate in sediments, including PCBs (Atlantic States Marine Fisheries Commission 2000; Haro et al. 2000). Downeast Maine’s rivers were likely never as polluted as those near major industrial activities and large cities; nonetheless, rivers in Downeast Maine are not free of pollutants. Dams and their associated industries have negatively impacted American eel stocks; however, it is difficult to quantify the extent of these impacts. Many dams are much older than the few available data sets describing long-term trends in eel abundances (Hall et al. 2011). An additional complicating factor is that unlike other diadromous species, American eels are not river-specific. Throughout their range from northern South America to southern Greenland, all eels are part of one intermixing population, which is influenced by a variety of factors including dams, fishing pressure, ocean conditions, pollution, predation, and climate changes. It is difficult to disentangle and study the effects of individual factors on such a widespread population (Haro et al. 2000; U.S. Fish and Wildlife Service 2011). In the twentieth century, local preferences largely turned against eels as a food item and toward the use of yellow and silver eels as bait, mostly for recreational fisheries targeting fish such as striped bass (ASMFC 2000). Yellow and silver eels are still used for human consumption to a small extent, mostly in ethnic cuisines, especially as sushi. Most of the eels used for this purpose are raised from the glass eel stage in aquaculture facilities overseas. A U.S. export market to support this business began in 1969. In recent years, the glass eel fishery has become quite profitable and has brought significant economic benefits to some Downeast Maine residents. With the establishment of the glass eel fishery, American eels were targeted at almost every life stage. This new aspect to the fishery, in addition to declining catch rates in many areas, prompted the development of fishery management plans to regulate the fishery. Maine’s first eel fishery management plan came into effect in 1995. The first inter-state management plan for American eels was developed in 2000 by the Atlantic States Marine Fisheries Commission. To learn more about modern-day American eel fisheries in Downeast Maine, see the “Fisheries Now” section of this website. Atkins, C.G. 1887. The River Fisheries of Maine, pp. 673-728 in The Fisheries and Fishery Industries of the United States Section V: History and Methods of the Fisheries (G.B. Goode). Washington, DC: Government Printing Office. Atlantic States Marine Fisheries Commission. 2012. American eel stock assessment overview. Alexandria, VA, asmfc.org/species/american-eel. Earll, R.E. 1887. Part VI: The herring fishery and the sardine industry, pp. 419-524 in The Fisheries and Fishery Industries of the United States Section V: History and Methods of the Fisheries (G.B. Goode). Washington, DC: Government Printing Office. Franklin, H.B. 2007. The most important fish in the sea: menhaden and America. Washington, DC: Island Press. Harper, B., and D. Ranco. 2009. Wabanaki traditional cultural lifeways exposure scenario, prepared for the Environmental Protection Agency in collaboration with the Maine Tribes. epa.gov/region1/govt/tribes/pdfs/DITCA.pdf. National Marine Fisheries Service. 2012. Diadromous fish passage: a primer on technology, planning, and design for Atlantic and Gulf coasts. Silver Spring, MD: NOAA National Marine Fisheries Service, nero.noaa.gov/hcd/docs/FishPassagePrimer.pdf. Natural Resources Council of Maine. 2003. Toward a new balance in the 21st Century: a citizen’s guide to dams, hydropower, and river restoration in Maine. Augusta, ME, nrcm.org/our-maine/publications/a-citizens-guide-to-dams-hydropower-and-river-restoration-in-maine/. Penobscot River Restoration Trust. 2013. Press release: Reconnecting the Penobscot River with the sea: breaching Veazie Dam on Maine’s Penobscot River, July 22, 2013, penobscotriver.org/content/5024/veazie-dam-event-press-release. Prins, H.E.L., and B. McBride. 2007. 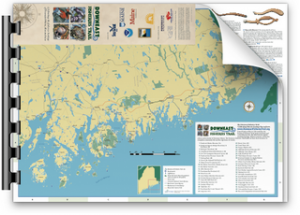 Asticou’s island domain: Wabanaki peoples at Mount Desert Island, 1500-2000, Acadia National Park ethnographic overview and assessment (second printing). Boston, MA: Northeast Region Ethnography Program, National Park Service. U.S. Fish and Wildlife Service. 2011. Endangered and threatened wildlife and plants; 90-day finding on a petition to list the American eel as threatened. Federal Register. Vol. 76, No. 189. Thursday September 29, 2011. Proposed Rules.